Layered deposits in the northern mid-latitudes. The objective of this observation is to examine layered features in an irregularly shaped depression and a nearby crater. Some researchers have suggested that the shape of mounds in large craters may be due to the wind. With this image, wind directions may be studied to see if they caused the irregular shape. 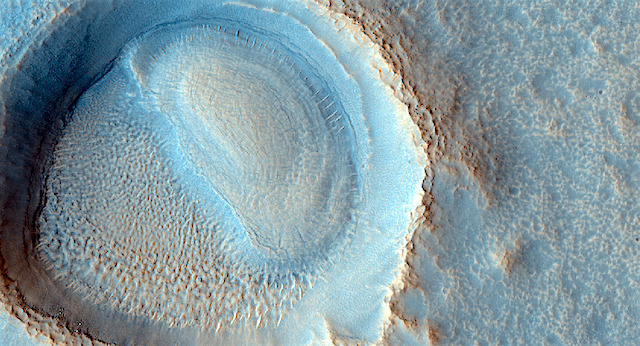 This entry was posted in Reports and tagged Beautiful Mars, High Resolution Imaging Science Experiment, HiRISE, Mars Reconnaissance Orbiter, mounds, MRO, NASA, University of Arizona, Utopia Planitia, wind erosion. Bookmark the permalink.